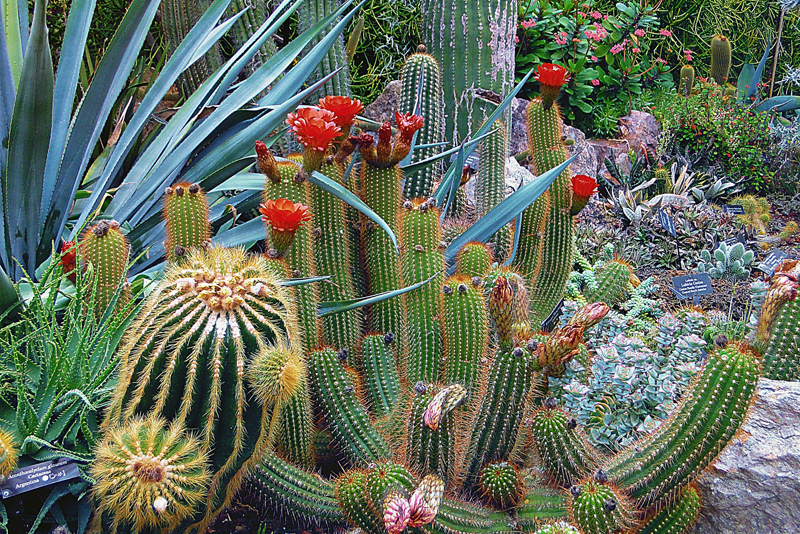 Terry Hewitt’s Complete Book of Cacti and Succulents is a good introduction to the world of these fascinating plants. It is not complete in its coverage of the many thousands of species of succulents, but it does strive to be complete in its breadth of information. The beginning chapters define succulent plants and cacti as a specific type of succulent. It gets into basic botany, plant anatomy, the various climates where succulents grow and the botanists who collected and cataloged them. There are examples of various plant shapes, leaf shapes, and succulent blooms. As with most DK books, the photographs dominate the pages. For those who learn by seeing, this is quite helpful. The next section of the book deals with growing succulents – which containers are appropriate, what potting mix to use, and how to make attractive arrangements. There is a step-by-step guide to making a desert arrangement using several plants with rocks as accents. A plant catalog fills a major part of the book. Plants are listed alphabetically by genus, with cacti being in a separate section from other succulents. Information for the plants listed includes the size of the mature plant, minimum temperature for the plant to thrive and the color of the flower. One thing I especially liked about the cacti section was that the photographs included the flower from each plant. In the succulent section there are usually several examples of each genus. Most commonly available succulents are included. Following the plant catalog is a section on plant care which covers all the basics. Propagation is addressed, as are plant problems such as spider mites and mealybugs. The book even includes instructions on grafting. Once again, the photos are invaluable. The reference pages at the end are a resource you may refer to again and again. There are lists of plants by light needs and climate, lists of trailing plants, groundcover and container plants, and even a list of plants according to which method of propagation is most suitable. A glossary and an index finish off the book. If you are looking for detailed information about specific succulents, you would probably be better served by a plant encyclopedia or a book dedicated to a specific genus. However, if you are new to growing succulents this book will give you a broad view. It has plenty of information to get help you grow you succulents successfully. This book was loaned to me by a friend. It is available in a large softcover format. It may be purchased by clicking on the amazon link below.